It’s time to once again celebrate the successes of our members! Congratulations to all from the team at the ACT Writers Centre. Alison’s new novel A Perfect Marriage was published by RedDoor and launched at the Essex Book Festival. Mark has had a local history book published with the Woodlands and Wetlands Trust – ‘The best system of trenches in Australia’. The book, about a forgotten Canberra place playing a key role in a forgotten national story, is yet to have its official launch, which will be woven around centenary commemorations of events in the final year of the War. George is Canberra’s ‘Lonely Planet Local’ for Lonely Planet, and has had multiple pieces published on their website including How to Live Like a Local in Canberra and 7 Top Reasons to go on a Round-the-World Trip. Jo had three poems in Positive Words’ December Issue, 2017. Michelle received the Society of Children’s Book Writers and Illustrators 2017 Spark Award in the Older Readers category for her middle grade book, Flying Through Clouds. Stephanie’s latest children’s book, Marvellous Miss May, Queen of the Circus, was published by the National Library of Australia Publishing, and launched at Harry Hartog Woden. Peter has recently had articles published in SBS Life, the Sydney Morning Herald, Frankie, the New York Times, Offset, Caught by the River, the Guardian UK, and Meanjin. Maura’s first children’s picture book, The Trouble in Tune Town, was published by Little Steps. We love celebrating our members’ achievements—big or small! 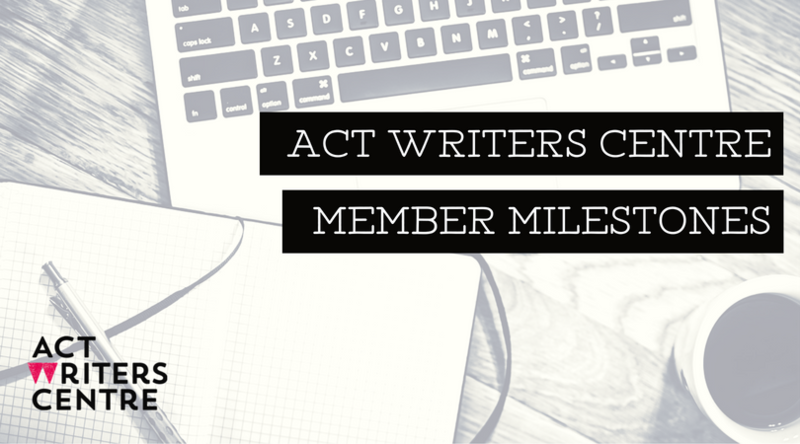 Send them through to communications@actwriters.org.au so we can include yours in our next celebratory shout-out.